Amber and I were absolutely thrilled to be selected to review Digital Science Online by Visual Learning Systems. If you have been reading the blog for a while, you know we've struggled lately in finding the right science fit for Amber. This product came at exactly the perfect time for us in our search for a science curriculum. For the purpose of the review, crew members were given access to both levels Digital Science Online: Elementary Edition (Grades K-5) and Digital Science Online: Secondary Edition (Grades 6-12) (currently $99 each for homeschoolers). Our digital subscription included admin, teacher and student accounts for an entire year! 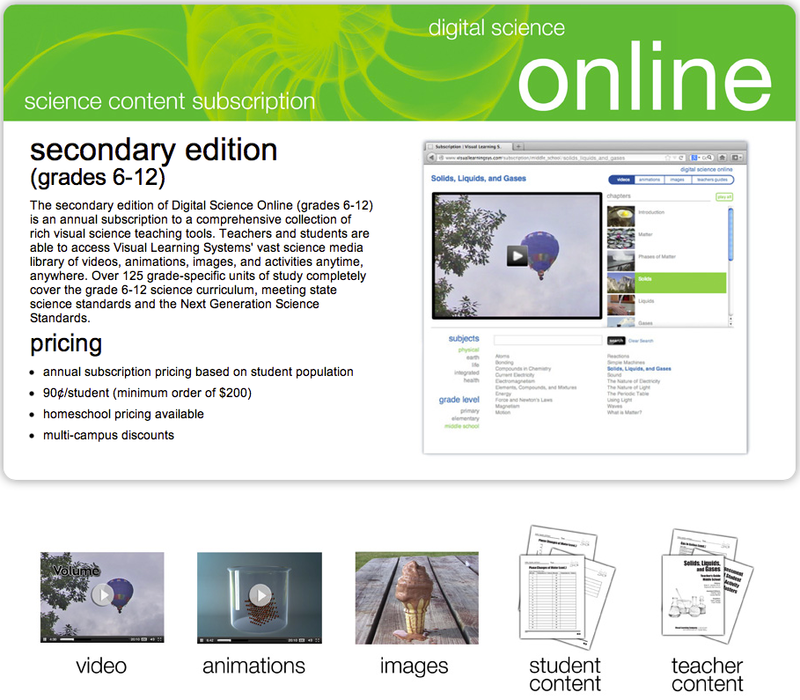 Since Amber is in 7th grade, we primarily used the Digital Science Online: Secondary Edition which is perfectly suited for both Middle School and High School students. The videos are not so difficult that a Middle School child cannot comprehend, but not too simplistic for a High School student. The additional activities definitely help gear the entire the curriculum toward the correct age level. For the rest of this review I will be discussing the Secondary Edition of Digital Science Online. As this is a completely online product, our first concern was how we would be accessing it. While we all have our own computers, Amber and I definitely prefer to not be tied to the desktop computers for schooling. I logged in with the teacher account from my computer to ensure everything was working and to learn the layout. I then logged in as both the student and the teacher from my iPad. There was absolutely no detectable difference between the computer and the iPad access. Amber has only used her iPad Mini to login through her student account and she has been utterly pleased with the functionality. So what exactly is Digital Science Online? It is a digital subscription service to online science videos covering an array of topics in each of the following science fields: Physical, Earth, Life, Health and Biology. But it is also so much more, and in fact can be used as a stand alone science curriculum. The student and teacher accounts both have access to a variety of Student Activities for each and every video. The activities include a preliminary and post assessment of the student's knowledge, video review questions, vocabulary sheets, experiments, and additional reading sheets with associated activities. Additionally, the teacher's account has access to instruction support material for each topic. The teachers are given ways to introduce the topic prior to the videos, a list of learning objectives, and a complete script of the video. Each video runs roughly 20 minutes and can be watched from start to finish with a single click, or can be watched by selecting the individual chapters of the video. Every video also has a verbal quiz at the end which can be conducted orally or you can choose to have the student write down their answers. The various animations and images used in the videos are also available for individual access to aid learning after the video has been viewed. The navigation is as simple as can be too. Each science field is listed below the video viewer, and once the major science field is selected the associated video choices are available to click and watch. After you've selected a video all the other features specific to that topic are available through a menu above the videos. It's clean and so easy to follow. I didn't have to explain the menu system to Amber as she picked right up on how it worked. Watching the science videos and working on correlating assignments. How did we use this service? A better question is "How are we using this service?" We have been so pleased overall with Digital Science Online, but specifically Amber has noted how impressed she is with the quality of the videos and the extremely clear narration. Even though the review period is over, we continue to use Digital Science Online and are thrilled that our subscription lasts for an entire year. We did choose to use Digital Science Online as a supplement to another science curriculum we had just started since it is not as robust as I would like. The digital subscription was such a perfect match for our situation because with Amber's chronic illness she often has days where she needs to be restful but still complete school work. Other days the dysautonomia causes Amber some pretty serious brain fog which makes book work quite difficult, if not impossible. To provide the best education possible, we have sought out options for learning that match Amber's varying abilities. We found that video learning is much easier for Amber on her poor health days. Since those days are more frequent than we'd like, we held off on the actual video watching for the days when Amber wasn't capable of book work. Amber usually watched two or three videos in a sitting and did a verbal discussion with me between videos. Depending on her cognitive ability that day, she may or may not have completed the additional activities associated with the videos. If she was not up to the activities immediately they were assigned the next healthy school day. I was extremely pleased with the provided activities as they helped to ensure that Amber understood what she had seen and heard in the videos. Amber was able to access the assignments directly from her iPad, but for the majority of the items I printed them so she could write directly on the worksheet. Amber was studying Astronomy when we started using Digital Science Online, which put the astronomy related videos in the Earth science section as our starting point. Amber has completed all of those, plus the weather videos, as well as nearly all of the Geology videos since we just began Geology. Before the school year is out Amber will begin a unit on Chemistry and we will be able to supplement that unit with the many chemistry related topics from the Physical science section of Digital Science Online. Amber found the videos to be interesting, yet brief enough that they don't hit the wordy and boring stage for her. She loved the portability of being able to use her iPad too. Amber is quite particular and verbal in her opinion of video lessons, but Digital Science Online successfully satisfied her requirements. I was overjoyed to find such a perfect fit for Amber's educational needs and learning style(s). I've even been tempted to skip some sections of our more traditional curriculum in favor of primarily utilizing Digital Science Online. Be sure to check out more reviews of Digital Science Online to see what other members of the Review Crew thought of this spectacular science resource.